At Smith Steelworks, we manufacture picnic pavilion kits across the United States and parts of Canada. Our pavilions are perfect for park and recreation areas, as well as church and campus areas. 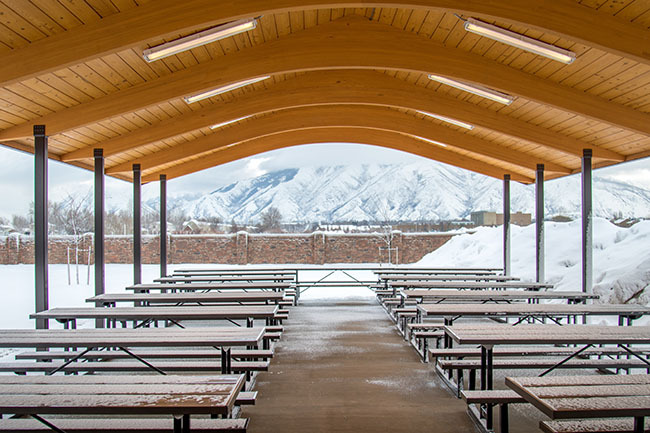 Call today at (801) 414-1724 to get started on your pavilion project. Why Choose A Pavilion Kit? Picnic pavilion kits are the most economical way to build a pavilion. We provide everything from the metal columns to the lighting equipment. With the purchase of the kit, you will also receive stamped engineered drawings. We are a manufacturer, not a third-party representative. This guarantees that you will receive the best prices and services on your pavilion kit. First, is the Glu-Lam Beam Tongue and Groove Deck. It can be customized to the color of your choice. You can view all color options here. Second, are All Steel Pavilions with steel beams, purlins, columns, and 24 gauge mega rib roof. You can view all color options here. The Glu-Lam Beam Pavilions are our most popular pavilion option. Does the kit pricing include the cost of freight to the job site? No it does not. You can request a freight quotation at the time the order is placed or we can provide a quote for the job destination. What is the lead time for the pavilion kits? The total lead time for the pavilions are between eight to ten weeks from when the purchase order is received. What if there is freight damage? At the time of delivery, the GC is responsible to note all freight damage on the bill of lading before signing it. Any damage not noted on the bill of lading will become the responsibility of the GC and not the freight company or the manufacturer. Do I get to choose the colors for the pavilion? Yes, we have a large selection of color options. You can view the options here. Talk directly to us today to get started on your pavilion kit!